If you prefer to travel in comfort and style, whether it be from our organised airport pick-up or maybe going to one of the dive sites away from Padangbai our brand new bus can definitely fulfil your needs. Able to seat up to 12 guests comfortably with all your luggage, we can cater for large or small groups and our driver we believe the best driver in Bali with years of knowledge about the roads and how to navigate them safely. If you’re a little tired from your journey all seats recline and you are able to catch up on some rest after another “hard” days diving in Bali. Pak Nesa is our amazing bus driver. Operating buses and coaches for as long as anyone can remember, Nesa is one of the most experienced drivers on Bali. 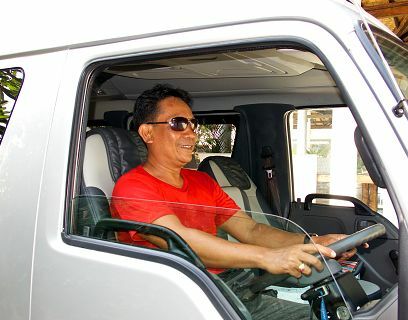 With his extensive knowledge of the roads and amazing Balinese driving techniques he is able to find his way anywhere and maneuver out of any situation in the safest manor. With our new bus and Nesa behind the wheel any drive is guaranteed to be pure bliss.